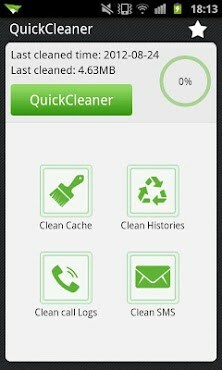 Quick Cleaner – Clean up all cache and histories to speed up your phone and optimize its performance! Four main functions to help you clean search histories, cache, call logs and text messages. Free your device memory and protect your privacy. Clean Cache: Clean cache from all your apps by just one tap. Clean Histories: Clean clipboard, browser history, Google Play store search history, Gtalk search history, etc.